Kiss has recently released six new Halloween inspired designs into their Nail Dress line! I've never tried this line before, so I was really excited to give them a go. I decided to try the Black Cat* ($10.99 CAD) design first, which would be no surprise if you knew how much of a cat lady I am! Unlike other nail stickers that I've tried, this formula isn't made from real nail polish. Initially, I thought that this would mean that I wouldn't really like these nail stickers, but this wasn't the case at all! With nail stickers made from real nail polish, you have to use up all of the nail stickers as soon as you open the packet. Since the Kiss Nail Dress ones are just stickers, you can save the rest for future use, and they won't dry up. You also don't get hit with the overwhelming nail polish scent when you open the packet! This pack comes with 28 nail stickers in varying sizes. I found that this pack did have a nice variety of sizes, so there should be something for everyone. I started by removing my polish, starting with a clean base. I then picked the appropriately sized stickers, and applied them to my nails. Then, you take the nail file that's included in this package, and file off the excess product. This whole process was very easy, and I must say that it was my best experience with nail stickers! These may not look as real or convincing as nail stickers made with real nail polish, but I don't mind at all. I loved how easy these were to apply, and you just peel them off to remove them. These are quite pricey, at $11 a pack, but you can get two uses out of this pack (or you could split it with a friend!). I think these are great for special occasions, and they would make a great addition to a Halloween costume. I'm in love with this cat design, it's so cute! 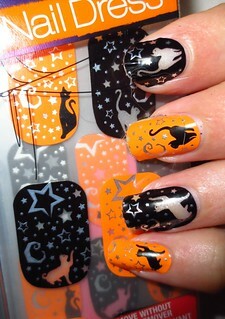 Cool Halloween nail art love it. 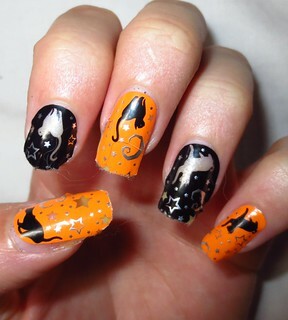 So cute and perfect for Halloween!